Adding several exciting new elements, the 2002 Ford F-150 was introduced with the assumption that it would continue the tradition of excellence that had made the F-150 the best-selling full-size pickup truck for the last twenty-four-years in a row. Again, it did not disappoint. Understanding the needs of consumers, Ford engineers sought to resolve the pertinent issues of the day. Included was a factor that Ford called "Tractive Force". Optimizing Tractive Force was based on the assumption that "power you could feel" was about more than just horsepower and torque. It was about having the right engine mated to the right transmission with the right torque converter. It was about getting the horsepower and torque to the right differential (with the right gear ratio) where the right size tires and wheels would put them to the ground in the most dramatic fashion. Offering a better way to get the job done, the Built Ford Tough family of trucks is adding new and innovative options with each new model year. Among the new features for the 2002 Ford F-150 were a new 7,700-pound payload group as well as the addition of a package geared towards off-roading and the outdoor lifestyle. It was called the FX4 Off Road Package and it was state-of-the-art. 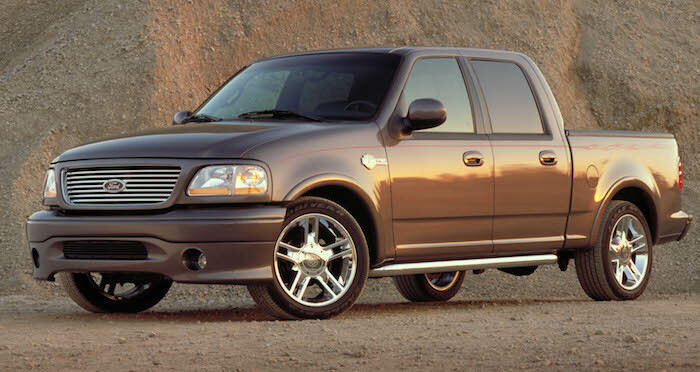 The luxurious King Ranch Package was now available as a SuperCab (instead of SuperCrew exclusively) and two near exterior colors were added to the Lariat. Electronic Temperature Control (EATC) was added as standard fare for Lariat and King Ranch trucks and a loose fuel cap warning lamp was added to models across the lineup. A spare tire lock was added as standard equipment and the 4.2-liter V6 engine was now ultra-low emission vehicle (ULEV) compatible. The Lariat Package could now be applied to the SuperCrew cab. HomeLink and Travel Note smart systems now got the Lariat Package connected as standard equipment. Air conditioning was standard on the the base XL Package but deleted from the Work Truck (still available as an add-on option). 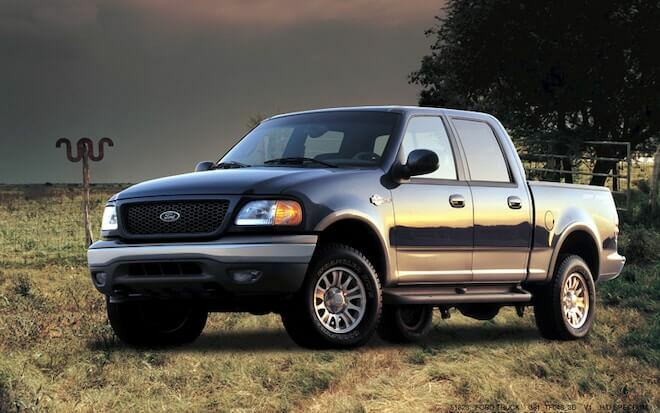 Available in three model lineups, the 2002 Ford F-150 could be purchased as a 2-door Regular cab, a four-door (backward opening rear doors) SuperCab, or a four-door (all full-size doors) SuperCrew. Regular cab and SuperCab trucks could be ordered with either a 6.5-foot bed or an 8-foot bed. SuperCrew trucks came with a 5.5-foot bed and all beds were offered in Styleside (sometimes called fleetside) or Flareside (also called stepside) configurations. The regular and SuperCab F-150's were built in Norfolk Assembly Plant, Kansas City, and Ontario Truck Plants. The SuperCrew was assembled in the Kansas City plant. Colors deleted for 2002 include Wedgewood Blue and Island Blue.